There was a buzz in the air during the 33rd edition of the Havana International Fair, Cuba’s weeklong commercial extravaganza. It was 2015, the year the United States and Cuba renewed diplomatic relations and U.S. companies were betting on new business opportunities on the island. But three years later, as the fair opened in Havana this week and Cuba’s dealings with the Trump administration are prickly, much of that enthusiasm has faded away. “Dismal” is how John Kavulich, president of the U.S.-Cuba Trade and Economic Council, describes both the level of interest by U.S. businesses in Cuba and the island’s current investment climate. “There continue to be some companies interested in doing things in Cuba, but for a country of 11 million people interest is nowhere near what it should be,” he said. Cuban state media has reported about 16 U.S. firms have a presence at the 36th annual fair, which runs through Friday, but it appears that fewer than that have set up booths. Among the companies scheduled to participate is Innovative Immunotherapy Alliance, a joint venture recently set up by Buffalo-based Roswell Park Comprehensive Cancer Center and Havana’s Center for Molecular Immunology to try to bring four Cuban cancer drugs to the U.S. market. Rodrigo Malmierca, Cuba’s minister of foreign trade and investment, said 2,500 foreign business executives, about 30 chambers of commerce and 60 nations are attending Fihav 2018 — evidence, he said, that the “world is with Cuba” despite its problematic relationship with the United States. Among the largest exhibitors are Spain, China and Russia. In 2015, when more than 70 countries were represented at the fair, the Cuban economy was growing. Companies from around the world thought they should get into the Cuban market quickly, before the budding U.S.-Cuba relationship would allow American companies to snap up all the best deals. U.S. exhibitors also were betting that with the rapprochement, the end of the trade embargo would only be a matter of time. But now the Cuban economy has stalled, the hostile rhetoric between Washington and Havana has escalated, Trump administration rules designed to limit business dealings with Cuban military enterprises have made U.S. companies wary and the Cuban pace for approving joint ventures and management contracts has been glacial. Still, in an interview with Cubadebate, a Cuban news website, Malmierca emphasized that foreign investment has become an economic necessity for Cuba. “We aren’t a country that is rich in natural resources nor is there sufficient national savings to make the investments our social and economic development requires,” he said. Miguel Diaz-Canel, who succeeded Raul Castro as president of Cuba’s Council of Ministers and Council of State, sounded a similar note as he cut the ribbon to open the fair Monday. The “ratifies international interest in trading with Cuba despite the blockade (the term Cuba uses for the embargo),” he said. 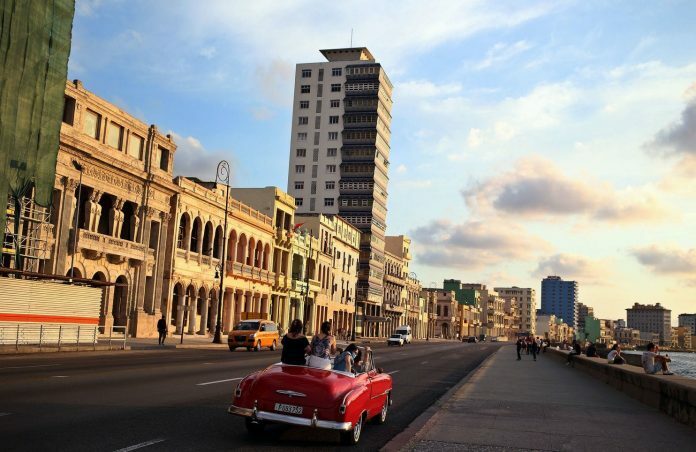 But some commentators who responded to the Cubadebate interview questioned the slow pace of efforts to attract investment as well as Cuba’s reluctance to allow Cubans themselves to invest in some of the projects that are being offered to foreign investors. Each year at the fair, Cuba presents its new investment portfolio. Last year, it included 465 projects for which it was seeking $10.7 billion in investment. “We are selling our country in pieces,” one commentator said. Relatively few agreements have been reached with U.S. companies and most of the interest has come from the airline, cruise and telecommunications industries. In one unusual deal, a Hialeah-based company imported two small shipments of charcoal produced by a private Cuban cooperative. The U.S. Chamber of Commerce, a longtime advocate of lifting the embargo, brought a delegation of about 40 representatives of companies in 2015 that were eager to meet Cuban officials and make deals. The chamber also launched its U.S.-Cuba Business Council that year. Kavulich said that both the Obama administration and the Castro government could have and should have done more to cement the business relationship while there was the political will to do so. Even though many Obama-era regulations continue and the Trump administration also has allowed deals licensed under Obama to proceed, “Cuba, by not taking advantage of the continued opportunities” also has contributed to diminished interest by U.S. companies that “are not seeing that Cuba wants them to have a role in its economy,” Kavulich said.